The European eel (Anguilla anguilla) is among the most important fish species. It once represented over 50% of the total freshwater biomass, but stocks have been declining for many years. Billions are thought to hatch in the Western Atlantic, the Sargasso Sea and many hundreds of millions of these, transparent tiny eels (called ‘glass eels’) arrive at the Western European coasts. Since most rivers are blocked by weirs, sluices, water pumps and hydroelectric power plants, those tiny eels are caught and translocated to upstream habitats. The latest scientific publications indicate that restocking is a crucial measure to accelerate the European eels’ recovery. 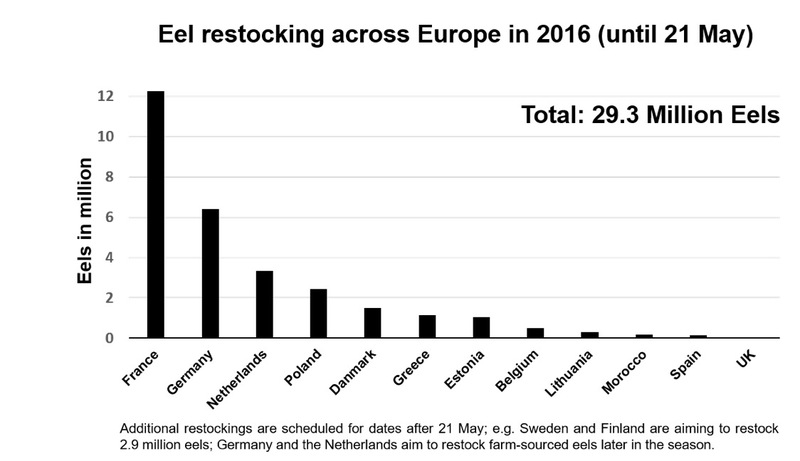 In the framework of an ongoing study about eel trade in European eel, we collected restocking numbers from all across Europe. Further results about eel trade within Europe as well as the illegal trade to Asia will be published at our annual conference on 31 May in London. About 55 stakeholders (eel farmers and traders, scientists, conservationists etc.) from all across Europe will meet and discuss urgent eel topics. This year, the conference will focus on the status-quo of the European eel policy and possibilities to counteract the illegal trade to Asia.